It’s 10:30 pm. Already 30 minutes past your bedtime. And on top of that, it’s a work night. You and your significant other are in the middle of a heated conversation…and not one of those “ok fine, I’m sorry” types. This has the potential to go from bad to very bad and fast. After sharing the Marriage Advice for My Little Sister post, I realized that people are split on the answer. And I found the fact that there’s really no middle ground super interesting! There’s one side that says you should never go to bed angry/upset. And then there’s the other side that says it’s 100% ok to go to bed angry. For me and Vishnu, if the argument isn’t a “marriage changing” one (which honestly, it never is! ), we’re going to bed. I totally get that this varies from couple to couple, but over the years we’ve learned that the anger and emotion don’t stand a chance when put to rest (pun intended!) for 7-8 hours. Your relationship isn’t on the rocks if you go to sleep mad. In fact, in our experience, it may just bring you closer! When thinking through why we’re in the “it’s ok to go to sleep upset” camp, I came up with three solid reasons. 1. When it comes to nighttime arguments, you bring the entire day’s energy with you to the table. Whether you intend to or not, work stuff, kid issues, crazy traffic, etc., it all comes with you. There’s a very very good chance that your significant other isn’t to blame for whatever is truly upsetting you. Unfortunately, he/she is just an easy target! Instead of perpetuating the argument, just go to sleep and start the next day with clean energy and a clean slate. 2. Going to sleep saves you from saying something you’ll regret later. Trust me on this…I have a bit of experience! I think most people would agree healthy arguments are the ones that address the issue at hand and nothing else. Well guess what, when you’re tired and cranky, it’s near impossible to stay focused on the present moment. And that’s when irrelevant and oftentimes hurtful things are said. 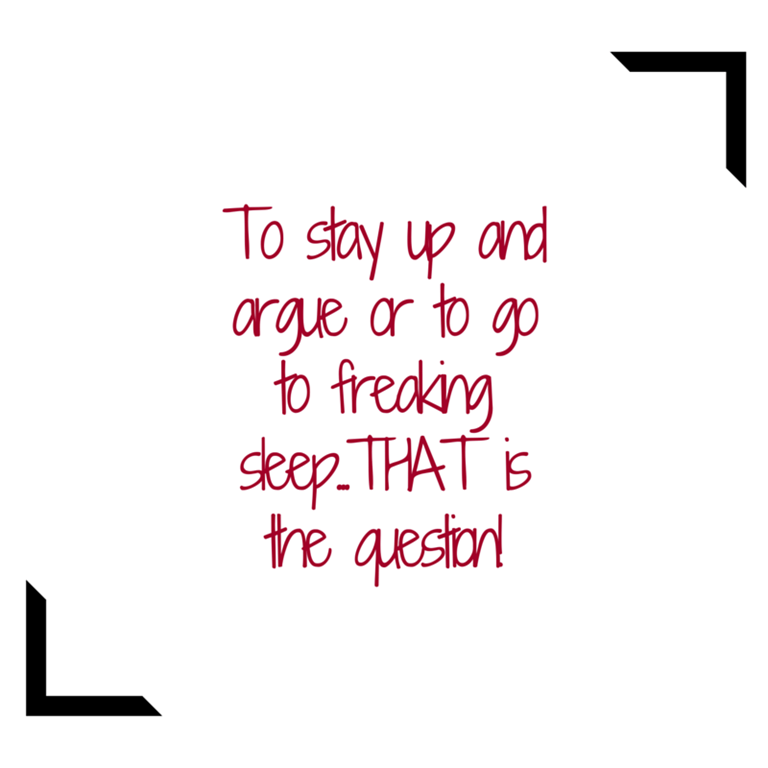 Honestly, it’s better to go to sleep and avoid that drama! 3. Sleep is an essential element for a healthy life. I don’t care what people say. Without proper sleep, you’ll never attain optimal health. The same goes for a healthy relationship. Sleep is the underrated magical cure when it comes to arguments. A good night’s rest brings a clearer headspace, a positive outlook, and rational thinking to the table. Now, I know what you’re thinking. You can’t possibly go to sleep mad at each other. I still have a hard time with that too sometimes. What Vishnu and I like to do is say, “Look, we’re both (or I’m) upset right now. Let’s get some sleep and talk about it in the morning.” Acknowledging that everything’s not ok and agreeing to talk in the morning puts me to ease. Like I said, I find the whole “don’t go to bed angry vs. go to bed angry” topic really interesting. And because every couple is different, there’s no right answer. All I know is that in the MIS household we place a lot of emphasis on getting good sleep! I’d love to hear more opinions. What side are you on? And more importantly, why? i totally see how sleeping it off could help because when you are cranky and tired, arguments only keeps getting heated leading it to nowhere.. but im one of those people who will need to clear things up before going to bed otherwise it will bug me whole night and i probably wont be able to sleep..which will make me even more crankier the next morning. Either way, arguments are no fun. The scenario you described is the WORST! I hate going to bed angry but sometimes I do for the sake of getting enough sleep and being able to function the next day. I’m on the side of it’s ok to go to sleep angry. Sometimes I just need to sleep and I’ll stop being so cranky haha. Seriously though if it is an argument that is just going around in circles and neither side is coming to a compromise or understanding it’s better to just sleep it off than rehashing the same subject over & over. That only makes it worse sometimes. Liz @ I Heart Vegetables recently posted…I Heart Vegetables Turns 5! This is so timely. We had a fight last night. Mostly because we’re stubborn… Evie went to the guest room to sleep and I stormed off to our room. A few hours laster a I woke up to her crawling in the bed and snuggling up to me. Fight over. LOL! We’re just a couple of mules.